During this time of year, we take time to speak about the beauty of Christmas. It is awesome to contemplate the wonder of God coming to earth in the form of a man, even as a baby. 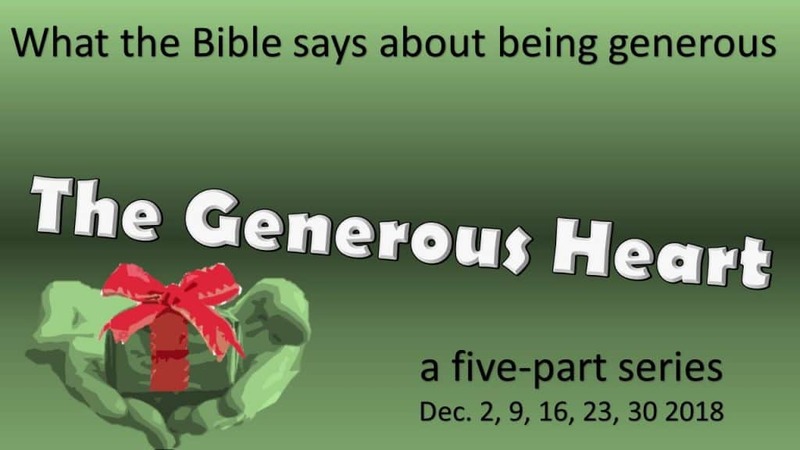 During this season, we will have a five-part-series on the Generous Heart. I will be sharing three messages, and Zane will share two. We are not speaking because we believe there is a problem with giving. Those who are generous can be encouraged. When we are generous in life, we reflect the heart of God. When speaking of giving we are talking about more than money, but also about our time, emotions, wisdom, and talents. A generous heart reflects the character of God. God gives us all the blessings of heaven. For those who are called by His name, He holds back nothing. His greatest proof of a generous heart is the giving of His Son to us. As children of God, we are to reflect the Father’s character. We make decisions about giving every day. We decide how we will spend (give) our time. We decide if we will give encouragement to another. Every action we have and every word we speak is an act of giving. At the end of the day, we feel “spent” because we give and give. The Bible says a great deal about decisions on giving. Our giving is important to God. The Bible has over 2,000 verses about money, possessions, and stewardship. What we do with our resources is important to God. A wrong understanding of giving is dangerous. Think about how many marriages and relationships are destroyed because of greed and covetousness. Our relationship with God can also be damaged. 1 Timothy 6:10 says, “For the love of money is a root of all sorts of evil, and some by longing for it have wandered away from the faith and pierced themselves with many griefs.” Being greedy is very dangerous and causes some to wander from Christ. We need to be on the alert. It is the season of giving. Christmas time is known as the season of giving. Last Tuesday was called, Giving Tuesday. Giving is an appropriate topic during this time of year. Our first message on having a generous heart is from Luke chapter 12. Let’s set the stage. Luke 12 takes place around six months before the crucifixion and resurrection. Jesus is well into His ministry and is now very popular. Luke tells us that during this teaching, there are thousands of people trying to hear Jesus teach. Imagine the scene. There are so many people, that they are stepping on one another as they try to get close. While Jesus is teaching, a man in the crowd says to Jesus, "Teacher, tell my brother to divide the family inheritance with me.” Jesus changes the subject to speak about money and greed. The man in the crowd thinks his brother should share the wealth with him and he calls on Jesus to settle the dispute. Jesus says, "Man, who appointed Me as an arbitrator over you?” In the process, the man gets corrected and not his brother. Jesus says that life is more than having a bunch of stuff. Greedy people seek to possess more and more stuff. If we understand this principle, we will rightly interpret the rest of the teaching. Mr. Bigger Barns thinks storing the abundance of crops is a great idea. He says to his soul, “Soul, you have many goods laid up for many years to come; take your ease, eat, drink and be merry.” The harvest is so plentifully, he accumulates enough crops for many years. His yield is not a slight increase, but an increase large enough to pay for the building of multiple barns and for the farmer to quit farming for many years to come. For Mr. Bigger Barns, life is all about keeping everything that comes his way. God calls him a fool. God says to Mr. Bigger Barns, “You will die tonight and now who will own all your stuff? Death has an amazing way of putting everything into perspective! The parable presents a choice. We can be a person who stores up treasure for ourselves or we can be people who are rich toward God. To be rich toward God is to know that life is much more than filling our barns with abundance. Being rich towards God is to think of how we can build God’s kingdom and not our own. Jesus expands on the meaning of the parable as He teaches His disciples. He reiterates what He told the man who wanted to share in the family inheritance by repeating the truth that life is more than what we possess. Not only should we not fill our barns with years of living, but we shouldn’t worry about food or clothing. Jesus takes His teaching to an extreme. Never mind worrying about next year’s income, don’t worry even about what we will wear today. Our basic needs should not be a priority in our thinking. If we want to be rich towards God and thinking about spiritual matters, we should not even worry about what to eat or what we will wear. What an interesting point Jesus makes. Which of us by worrying can add one single hour to our life? Don’t even think about adding one year or a month. Who can add one hour? None of us can do this little thing. Worrying about stuff has no benefit. The reason Mr. Bigger Barns stores up years’ worth of crops is because he worries about the future. He knows he can’t possibly use his abundance in one year, so he stores up for the years to come. He doesn’t know if next year’s crops will be successful, so he worries that he won’t have anything in the future. The biggest worriers in God’s eyes are those who have the biggest barns. They hoard because they are afraid God will not provide for tomorrow or the upcoming years. God isn’t saying that we should not have a barn or a savings account. What He is saying is there is a point where the barn building and the savings are excessive and greedy. God is the one who provides Mr. Bigger Barns the abundant crop. God gives the increase. Mr. Bigger Barns did not trust God to provide in the years to come. Jesus says that we need to consider birds. They don’t have barns for tomorrow. God feeds them, and God sees us as more valuable than birds. Therefore, don’t be a greedy barn builder. Trust God by being rich towards Him. If we have an increase, be generous. Do we ever stop to think that the reason God gives us the increase is so that we may be a blessing to other people? Jesus continues His teaching by helping us understand the root of greediness and worrying that we will not have enough. Faith is the answer to greediness. Solomon is the richest man that ever lived. He wore opulent clothing. But, even Solomon is not dressed like grass in the field. God looks at the simple grass and covers it with beautiful lilies. If God thinks about how to clothe the grass, how much more will He clothe us? We need to have faith that God cares about us and will provide for our needs. God believes His people should think differently than the people of the world. The world does not know God. But, we know Him. We know everything is in His power and control. We know that God is provident over the crops and the rain. We know that God is sovereign over every economic factor which brings us poverty or prosperity. Most importantly, we know God is loving and good. We know God as a heavenly Father. Just as an earthly father provides for his children, our heavenly Father knows our every need. Our Father knows our need before we realize it is a need. He is watching over us. Jesus is saying that our view of possessions reveals the depth of our faith. If we have faith that God loves us and cares for us, we will not worry. But, if our faith is small, we will worry about everything and our worry will turn into greed. We will try to keep everything for ourselves, and when we get more, we will build bigger barns. When we live lives of greed, we are living like the people of the world. The people of the world don’t have a heavenly Father. To them, God doesn’t exist. They run around worrying about filling their barns. They don’t have a heavenly Father to provide them their daily bread. They rely on their own effort. The people of the world look at Mr. Bigger Barns, and they wish they were just like him. They think Mr. Bigger Barns is free of worry. But, bigger barns doesn’t stop death from knocking at the door bringing with it the reality of eternal life. People don’t think about spiritual matters. Their eyes are not on eternity, but they are on this earth. Jesus teaches an alternative to the pursuit of earthly possessions. He speaks of having an eternal perspective. Our Father is generous. He looks at our poor estate and decides to give us everything we need. We are joint-heirs with Jesus. God gladly gives us His entire kingdom. This is an incredibly reassuring word from our Savior. We are a people with an inheritance in heaven. It looks foolish of us to chase around trying to possess things on earth. When we chase after things of the world, we look like a billionaire spending their days looking to see if someone dropped a quarter near a vending machine. God doesn’t want us to be greedy. Our heavenly Father doesn’t want us to worry about whether or not we will have enough to live on next year. God wants us to have faith that He will provide our every need. We don’t have to build bigger barns for next year. What God wants us to do is to be very, very generous. He wants us to be the opposite of greedy. Instead of taking all of our gains and building bigger barns, God wants us to give to charity. God is not saying we have to sell our house and car and live as homeless people. What He is saying is that fighting over the family inheritance, building a storehouse so we can live in luxury over the next 20 years, or constantly worrying about life is not how He wants His children to live. Should we have a retirement account? How much is too much savings? When does having a bigger barn become too big? Should I sell everything and give it to charity? What if I sell half and give it to charity? Let me do my best to help us think rightly about this text. Here is the danger. I don’t want to oversell or undersell what God is saying. Rather than answer these questions directly, let’s allow Scriptures to be our guide. We do know that in the very beginning of Acts with the founding of the first church, that everyone shared equally. Nobody lacked in the church. They were generous toward one another. Therefore, we are to make sure that we are generous toward one another. God calls us to have a generous heart. Proverbs teaches us that if it is within our power to help someone in need, we are called to help (Proverbs 3:27). We do need to have faith that God will provide. David says this, “I have been young, and now I am old, yet I have not seen the righteous forsaken, or his descendants begging bread.” We need to trust God completely. He knows our situation because He is the one who puts us in that place. If we are hungry, there is a good reason. We are to live like people who are given a kingdom. God promises never to leave us nor forsake us. Our Heavenly Father is a Trillionaire. He is always watching over us. Don’t worry, if we need something, He will make sure we will get it. We should never tell someone not to give everything if they are giving by faith. We all remember the story of the poor widow who put everything she owned into the treasury at the temple (Luke 21:104). She gives everything. Jesus doesn’t say it was foolish and that she now will have to rely on others for her food. Jesus doesn’t say; she is needier than the temple treasury so she shouldn’t give. Jesus doesn’t say; she should be receiving from the treasury. It is remarkable that Jesus applauds her for what some might think is foolishness. If someone asks how much they should give, we can only quote what the Scripture teaches. Each one must do just as he has purposed in his heart, not grudgingly or under compulsion, for God loves a cheerful giver. (2 Corinthians 9:7). There is no list of right and wrong answers. What we do know is to be greedy is sinful and to be generous is to be like Christ. We are new creatures in Christ. God is changing us into the image of Jesus. Greed is not a Christlike character. Don’t be greedy. If we want to be like Christ, we will be generous to those who are in need. God looks at our heart. He knows whether we are generous or greedy. We need to ask God to show us what He sees. MAIN IDEA: Seek first the kingdom of God and His righteousness while trusting God to meet all your needs. Be forewarned. If you are sitting here this morning and say, I know I can be generous, God will test your faith and give you an opportunity. I’ve had times when I thought I was generous before God, but God gave me the opportunity to be tested. Whenever we are seeking to build and invest in the kingdom of God, we will never fail. When we seek to build our kingdom, we will fail. As we give, we may know that God is good. We may trust Him.